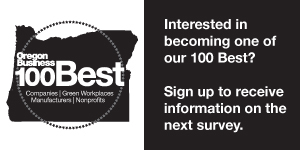 If your organization made this year's 100 Best Nonprofits to Work For in Oregon list, share your achievement with customers, clients and employees with 100 Best Nonprofits trophies, window clings and other branded merchandise. Mark your success as a 2014 Best Nonprofit with an engraved acrylic trophy. The trophy will have the 100 Best Nonprofits logo and your organization's name. Five window clings are included free with your order. Order by October 17th and we'll double your free window clings! Show your clients, customers and employees you're one of The Best with window decals. The 4 inch window cling is affixable to front doors, service vehicles, office windows or any other surface. Price — $3 each or $30 per dozen. Our merchandise partner, Southwick Specialty Advertising, offers many other high-quality products. Thousands of items can be branded with the 100 Best Businesses logo and your logo. Let us help you pick just the right product. Below are a few examples with special 100 Best pricing for your consideration. Can be imprinted with the 100 Best logo alone or with your logo. The newest trend in paper, made of stone. Remind your employees about the award at their desk. An inexpensive way to share your award with employees and customers. Good exposure internally and externally of the award without breaking the budget.